Get your Montana insurance license using an America’s Professor online training course. Our comprehensive video lectures, review questions and study guide will help you learn, and retain, the material needed to pass your Montana insurance license exam the first time! I am completely new to the insurance industry. The AP P&C course was the only tool I used to prepare for my exams. I passed the Property, Casualty and Surety exams the first time with high scores. The professor's mnemonic devices were incredibly helpful; I could hear his little hints in my head as I was reading the questions. Highly recommended! AP Team, I just wanted to say hello and give a Huge Thank You for your excellent training videos and text books. On each of my first State Exam attempts, I have passed the following exams in Billings, (Property, Casualty, Surety, and Life). Not only did I pass them on my first attempt, I passed them with flying colors That in itself would be good reason for this email, but it’s not the reason, I’m very excited. About 2 years ago, I got my Health Insurance License, but it took me four, yes four attempts to pass the exam. It was very frustrating to say the least. I was using one of your competitors, “ExamFX”. This time around I am extremely happy that I went with the AP team! Your videos and text books were outstanding and it could not of prepared me more for the exams! Here are my general and state exam scores on first attempt. Crushed it on my 1st try! Wouldn't have been able to pass so easily without this course. I was well prepared from both the on-line lectures and the practice questions. I would highly recommend this course to anyone taking P&C. Jack's quirky examples stick with you and make test taking time easy-peasy. Thank you Jack and everyone at America's Professor!! Great course! It really helped and Administrators were great about giving me an extension. I would highly recommend to anyone studying for any insurance licenses. Whew! I passed! There is a lot of information packed into this exam prep. All of the review questions throughout the course are helpful and explains the right answers at the end whenever you miss something. The customer service is excellent. The videos were entertaining and funny at times and because of that I was able to retain lots of information. I can't imagine a better way to prep for the exam! The America's Professor staff is also extremely kind and very helpful! Thank you all so much! In the last 2 weeks I took both the property & casualty and life & health courses. I did the P & C course and testing first, followed by the life & health. Jack does an amazing job as instructor and makes the content memorable. Although you are allowed 40 days I really liked his suggestion that the sooner you take it, the more you will remember early on! I watched the videos, took the tests, simply reviewed my high lighted materials and took each exam, passing immediately. I also wanted to mention that I had several interactions with Pat over the phone and he was just as fabulous to deal with! Highly recommend, 5 stars!! The course and material were really easy to follow and taught in ways to help remember. I passed my MT Life & Health on the first attempt. Thank you America's Professor for your help in preparation. The practice tests after each chapter and every section made me feel confident and ready! Thank you! This course was a God send. I remember that Mr. Morton said that if will come to you when you need it. It did. I passed on the first try! Now I am working on my Life only producer license. I would highly recommended this coarse to anyone who wants to put the work in and pass the very first time. It was a perfect mix of reading; highlighting; lecturing and plenty of questions to make it stick in your brain. Mr. Morton did an excellent job of simplifying terms and relating ideas/stories on how to remember certain criteria. I found this course to be very beneficial in the testing process. Great preparation course! The teaching is well planned and designed. I especially appreciated the extra 'tricks" to help remember points. It worked, I passed both exams on the first try! I was not able to complete all of the training in a short amount of time and so spending time reviewing earlier topics was VERY important. I would definitely use this resource again! This program again was helpful in me passing my P&C and Surety tests, I have taken tests in Wyoming and now in Montana. The only part that was more of a challenge was the Surety test, I passed the 2nd time but the questions were not what I was ready for. There were things asked on the exam that I don't feel were covered in the AP course. Maybe need a little more for the Montana folks that have to take it on its own. Overall I would recommend this course to anyone needing to take the Insurance licensing exams for any state. The online lectures, text and review tests were excellent. This program made a very complex and difficult process managable. Highly recommended. Passed first try after 4 days of preparation with this course. Cannot imagine how I would have succeeded without it. Please also check our frequently asked questions about the Montana Insurance Licensing Exam. Whether you want to get licensed to sell insurance for the first time or you’re going for an additional license to expand into a new market, America’s Professor gives you everything you need to pass your exam on the first try. Our Montana pre-licensing insurance courses have been carefully developed by AP’s founder, Jack Morton, who has 30+ years of experience helping students like you with insurance exam prep. Jack makes learning complex insurance concepts and terminology fun by weaving in amusing stories and straightforward examples into the course material. See for yourself—view a demo. Prepare: You must know the material inside and out come exam day. There’s no “winging it” when it comes to insurance licensing tests. This is where America’s Professor comes in. Our courses include everything you need to prepare, including a hardcopy textbook that covers everything you might encounter on the exam, 24/7 access to our online suite of streaming videos (45-day subscription, with extensions at no charge, if needed), and our first-class customer service. Pass: In Montana, you must be licensed to sell or even discuss insurance with customers. Getting licensed means passing the exam. Passing the exam means getting a score of 75 on both sections of the exam—the national section and the state-specific section. America’s Professor will prepare you for both parts. Apply: Once you’ve passed your exam you’ll need to do a couple more things (discussed below), including formally applying for your license. Once you receive it, you can start selling or discussing insurance! 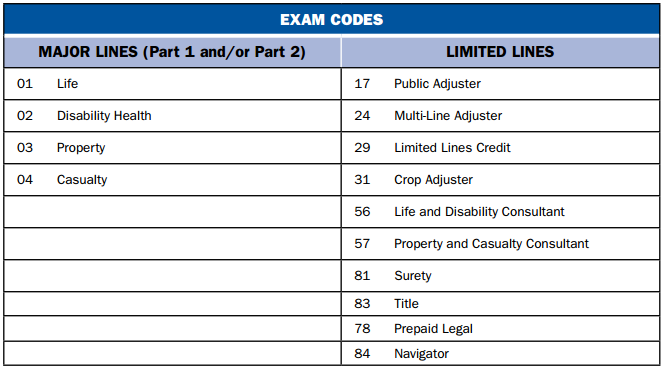 Montana has exams for the 4 main insurance lines as well as several limited insurance lines (see chart below). There are two parts to each exam: a national section and a state-specific section. You need a score of 75 on each part—the two scores are not averaged together. Test Registration: Pearson VUE is the company that administers the insurance licensing exams in Montana. Call the company at 1-800-274-8906 to schedule your exam date; calling at least 3 days in advance will ensure you get the date of your choice. Testing Centers: There are several testing center locations in Montana; there’s also one in Spokane Valley, WA, for those who live on the western end of Montana. See the chart on this page for more information about testing center locations and exam frequency at each location. Fingerprinting: You must get fingerprinted in Montana as part of the insurance licensing process. Pearson VUE has contracted with MorphoTrust USA™ to provide digital fingerprinting on-site at the Billings, Missoula, Helena, and Spokane testing centers. Visit the MorphoTrust USA website at https://pearsonwest.ibtfingerprint.com/, or call 1-866-761-8069, Monday through Saturday 8 a.m. to 5 p.m. (Pacific Time) to schedule a fingerprint reservation at your Exam Center. You MUST schedule an appointment with Pearson VUE for the insurance examination PRIOR to contacting MorphoTrust USA™ for the fingerprint appointment. License Application: Once you’ve passed your exam and had your fingerprints taken, you must officially apply for your license through the National Insurance Producer Registry (NIPR). There is no fee for a producer license in Montana. View any fees you will be assessed and apply for your license on this page. This is the final step in the process. Once you receive your license, you can get to work!